Whenever I see that Megan Gorman, the designer behind Made for Mermaids has a tester call out, I jump at the chance to apply. Megan’s daughter is close in age to mine and she always seems to have something coming out that works well for us. 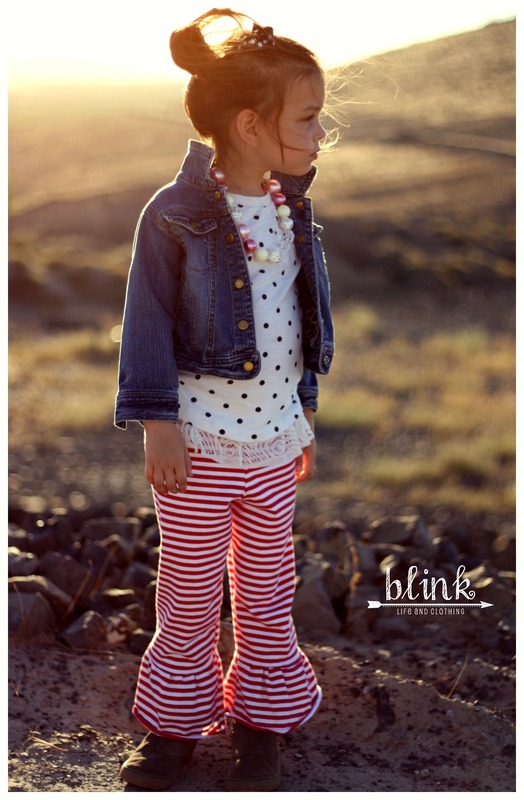 The newest release, the Hailey Ruffle Pants certainly fall into a “need” for us as preschool starts soon. My daughter is a skirt/dress-a-holic and doesn’t willingly wear pants or leggings (unless they’re UNDER a skirt or dress). With the ruffle around the waist of these, we’re calling them her “skirt pants”. If you’re a mama of a strong-willed fashionista, you understand. The pants are a comfy fit without being a super wide leg. I appreciate that the ruffle at the hem is sized well so that it isn’t too over the top (although, you could certainly cut them longer and ruffle more if that’s the look you want). The waist ruffle is the icing on the cake – it too is sized appropriately so that it’s a cute added detail but not too bulky to look silly. Of course, if you’re looking for a more basic pant, the waist ruffle can easily be omitted. I made my tester pair out of a red and white striped knit with a bit of stretch. My waist ruffle is a stretchy lace-like fabric I found at Joann earlier this summer. The pattern is written to allow you to use either woven or knit for the pants as well as the ruffles! The waistband needs to be a knit with a good bit of lycra in order for the pants to stay up. Like Megan’s other patterns, this one comes in sizes 1/2 – 14. Testing for Megan was a pleasure and I appreciate her taking feedback so well and making changes for a better fit. The final version of the Hailey Ruffle Pants should be out this week and you’ll be able to get your copy on Etsy or Craftsy. Run and make your sweetie a pair of “skirt pants”!